May 13, 2015 -- A Swiss-led project that aims to bring low-cost, quality digital x-ray units to developing countries has unveiled its prototype. EssentialTech, the group behind the GlobaldiagnostiX device, will now concentrate on improving the system until it is ready for technical transfer. The prototype, which successfully produced digital x-ray images of a phantom hand at the end of 2014, is the outcome of four years of research and innovation through an alliance of 35 researchers across Switzerland and Cameroon. EssentialTech, a program run by the Cooperation and Development Center at the Swiss Federal Institute of Technology (EPFL) in Lausanne, raised 3.5 million Swiss Francs (3.4 million euros) to complete the first phase of development (i.e., the design and building of the prototype) from several foundations and a grant from the state. 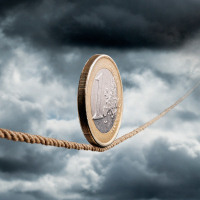 It now needs around 1.8 million euros for improvement and fine-tuning before industrialization, which should take about a year, according to program leader Dr. Klaus Schönenberger, PhD. The GlobalDiagnostiX prototype and leadership team. 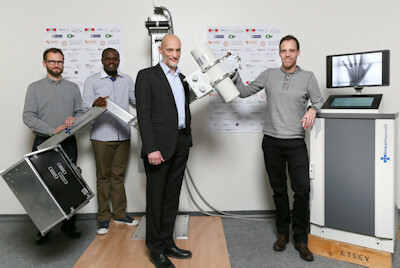 From the left: Bertrand Klaiber, technology transfer manager from the Cooperation & Development Center at the EPFL (Swiss Federal Institute of Technology in Lausanne); Dr. Jean-Roger Moulion Tapouh, a radiologist at the University Hospital Yaoundé Cameroon and project manager in Africa; Dr. Klaus Schönenberger, program leader; Romain Sahli, project manager Switzerland, EPFL. Image courtesy of Alain Herzog, EPFL. "After that second phase we will have gone as far as we can and we will have a complete second, and more developed, prototype," he told AuntMinnieEurope.com, adding that the plan was to launch GlobalDiagnostiX as a fully-fledged business by July 2015. EssentialTech's goal is to develop technologies and business models to fight poverty. It has two project managers, one in Switzerland and one on the ground in Cameroon, the device's pilot territory. The program has worked directly with Cameroon's Ministry of Health and local technicians and radiologists, to come up with design features that meet the needs of potential users. One such key component is a robust generator to combat insufficient and instable energy supply. Another is a mechanical arm, manipulated by weights and balance, rather than a digital electronic arm. In a humid and dusty environment, electronic touch button systems fail quickly whereas "old-fashioned" mechanical systems are more resilient. Back in 2011, Schönenberger promised that the x-ray unit would be a tenth the price of conventional digital units, this with maintenance factored in over 10 years. Four years later, the figures have not wavered, and nor has his conviction that the device will succeed where others haven't. 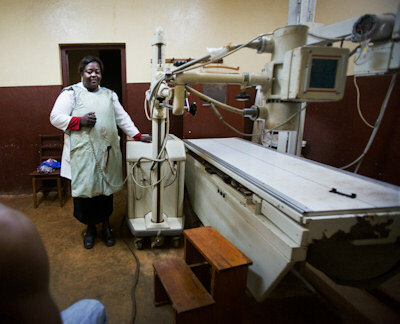 Above: Conditions in many African hospitals remain poor. In this photo, a permanent radiology unit broke down, necessitating use of a mobile unit. The technician is wearing a substandard apron, degraded with use and poor storage conditions. Below: A technician stands at the controls of an x-ray machine behind a wall missing its lead glass screen. He wears a lead apron, but his head is unprotected. "Staff working in this kind of environment are the real unsung heroes," Dr. Klaus Schönenberger said. Images courtesy of Sylvain Liechti. "A minister of health in an African country told me that the ministry bought three digital x-ray machines from a big company. Only a few months later, all three were sitting idle due to disruption to energy supply or were broken and in need of maintenance. These machines didn't have the right DNA to survive in this environment," he noted, pointing to tendency for the larger companies to simply try to adapt and re-use existing platforms and business models. By designing a system from scratch that is adapted to its future environment and involving customers on the ground in the market concerned, Schönenberger believes EssentialTech has done as much as it can to ensure that governments and private clinics will invest in it. "We have re-thought the machines so they have the right DNA and the right business model, or 'upbringing,' " he noted. "Radiology has been evolving in one direction for the past 120 years. We have completely changed that direction and ended up with an utterly different system that is right for the developing world." Antiquated methods persist throughout much of the developing world. Image courtesy of Sylvain Liechti. The team is developing a user-friendly interface that will enable staff of different training and language levels to deploy the device easily. The interface will include tutorials based on an adapted version of World Health Organization (WHO) guidance for analog systems. A one-page tutorial per x-ray position for the 140 listed in the guidance will be integrated into the digital system. EssentialTech is also exploring teleradiology and telemaintenance capacity to establish whether this is a solution that can be incorporated into the more advanced second prototype. The latter would work through the machines themselves automatically sending data about their working status back to a local GlobalDiagnostiX hub. This sort of connectivity would also provide the hub with data about the social impact of the devices. The GlobalDiagnostiX project has resulted in the esta­blishment of an alliance of more than 35 researchers, engineers, and specialists, from all fields. In Switzerland, the alliance involves several EPFL labo­ratories, 10 HES-SO (university of applied sciences) research groups (from the health, engineering, and design fields), the Paul Scherrer Ins­titute, the EssentialMed Foundation, who initiated the project and is responsible for its valorization, the Swiss Tropical and Public Health Institute and the CHUV (Lau­sanne University Hospital). In developing countries, the project partners include the University Hospital of Yaoundé (CHUY) in Cameroon, the University Research Center on Energy for Health Care (CURES) in Cameroon, and local stakeholders in developing countries. While many of the issues such as energy supply, mechanical manipulation of the arm, and the ability to take a good quality digital image are resolved, others need further exploration and development. The second phase over the next year aims to hone existing features and integrate more advanced tools to create a final feasibility prototype. 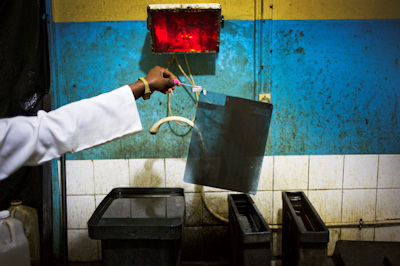 This unit will also include a shield to protect users from radiation exposure, according to Schönenberger, who has witnessed technicians working without basic protective equipment such as shields or aprons of adequate quality in radiology departments across Cameroon. "We are also working on including the supply of aprons into the business model. Other factors such as proper commissioning and appropriate room setup are also crucial aspects we are trying to solve," he said. The final units will be on sale within three years if all goes to plan, hopefully to be distributed through a threefold business model. 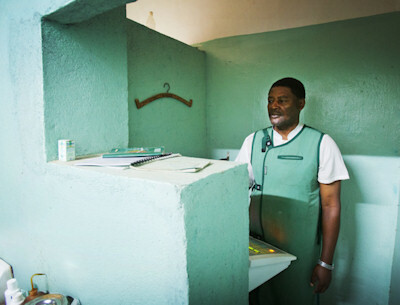 The first payor will be the ministry of health of any target country, but private clinics, often faith-based, account for 50% of all medical acts in Africa, so these would prove a second stream of investors. The third prong would comprise development organizations such as the Swiss Agency for Development and Co-operation, who will help to deploy them through their own networks in the countries where such organizations are active, as soon as the systems are commercially available. "I'm convinced that some units will be sold in richer countries, such as China, Brazil, and even Europe," Schönenberger said. He added that in Europe there would probably be a slight mark-up in price, but the details were yet to be finalized. The business venture would have to be viable and the units could not be sold at a loss. "It's a risky business but we have done everything to put chance on our side through factoring in the environment from the beginning. We intend to solve a problem that WHO identified in the 70s."